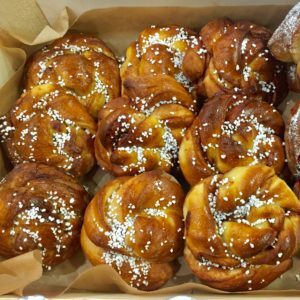 Skogen Kitchen are delighted to offer a pre-order service for our signature buns. Order before 5pm for next day collection. All bun orders will be freshly baked in the morning and ready to collect from 9.30am on your chosen collection day. If you would like to arrange delivery within the Oxford Ring Road (for an additional fee) please contact Skogen Kitchen on 01865 580104. Unfortunatley, we are currentlty unable to offer delivery outside of the Oxford Ring Road. Choose your Buns: Select 1, 2, 3 or all 4 flavours.